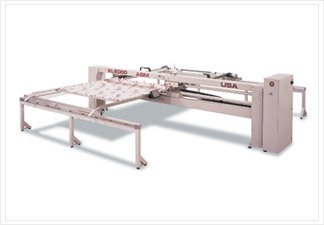 XL6000 Computer Quilter can produce up to 250 comforters per shift with just one operator. The XL6000 Computer Quilter is a custom servo automation system that we designed and manufactured for the industrial quilting industry. It has the capability to produce up to 250 comforters per shift with just one operator. Featuring a three-axis digital brushless servo control system, which provides superior quality patterns, ease of pattern and size changes, as well as low maintenance operation. The XL6000 is an IIS-based custom servo automation system, and is capable of sewing various quilt patterns that are supplied to the machine in a G-code machine format. G-code is used because it is the most widely used CNC language. The design incorporates the Emerald Programmable Automation Controller, 3 servo motors, Emerald servo drives, as well as fiber optic devices. The Emerald programming language has a powerful set of math, motion, I/O and networking instructions for this custom designed software application program. The system can run standard material sizes up to 96” x 108”, and features maximum axis speeds of 1,000 inches per minute, and maximum of 4,000 stitches per minute. With a footprint of 5′ x 17′, the XL6000 utilizes 1/6 of the floor space of its nearest competitor. A testament to the quality and durability of the XL6000 are the over 800 installations worldwide. A Servo Controlled Sewing Machine that is used in the Textile Industry. This Machine is Capable of Sewing Various Quilt Patterns that are Supplied to the Machine in a G-Code Machine Format. A DLL (data description language) Program that Allows the Translation of Pattern G-Codes to a Format that the EMC-2100 Controller Understands. An Industrial Indexing Systems EMC-2100 Programmable Automation Controller Controls all Three Servomotors. Industrial Indexing Systems Designed and Manufactured the SERCOS Based Custom Servo Automation System for the XL6000 for the Industrial Quilting Industry. Design Incorporated the Emerald Programmable Automation Controller, 3 Servo Motors, Emerald Servo Drives, and Fiber Optic Devices. Emerald Programming Language (EML – Emerald Motion Language) has a Powerful set of Math, Motion, I/O and Networking Instructions for This Custom Designed Software Application Program. SFO 3251 is an application written in the IIS EDE (Emerald Development Environment IDE) with EML. This application contains the necessary routines to direct the operation of the EMC-2100 during sewing and other various tasks. SFO-3252 is a front-end application written in Visual BASIC as an operator interface. This is an application that is loaded into a touch screen to provide the operator with various command buttons and menus to direct the operation of SFO 3251. Servo System Provides Precise Phase Synchronism Between the X-Axis, Y-Axis and the Needle. Emerald Servo Controller Drives the Motors Attached to the X, Y and Needle Axes. The Most Demanding Part of the Application is Keeping the X, Y Actuators Phase Locked to the Needle so There is Consistent Stitch Length is Produced Under all Sewing Conditions. The result is a state-of-the art performance and superior connectivity to other systems and network components. Controller is programmed using our friendly Emerald Motion Programming Language (EML) and powerful new Emerald Development Environment (EDE) software tools for the PC.